Summer and Will both followed Jessica Watson’s solo sailing trip around the world. They ‘meet’ each other online through her Facebook site and become friends. Who wouldn’t become close when you share a passion? But everything changes when Will returns to his hometown, which happens to be where Summer lives. What would you do if a friend you trusted deliberately deceived you? What if there were good reasons for the deception? Summer is profoundly deaf and uses sign language to communicate. Can she and Will find a way to be friends with such a huge communication barrier. And what about their friends? Will they accept differences that neither Will nor Summer see? This tale of trust and loss, taking risks and second chances took me into unexpected worlds on land and at sea. I learned how sign language can look like the things it depicts and realised how silence doesn’t have to be the barrier we think it is. A heartfelt tale of love and loss, on so many levels. 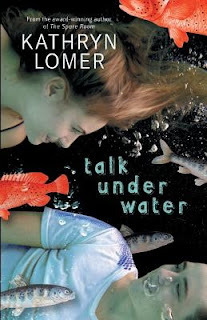 Talk Under Water is a keeper.